The current hot debate in the blogosphere on free versus paid really points to the failure of our current models. Dalton Caldwell's "Announcing an audacious Proposal," is an eloquent cry for services that serve their users, not advertisers. Fred Wilson has countered with "In Defense of Free," which champions the value of a mass audience that seems only reachable by free and freemium. And often neither paid nor free works very well -- just look at the newspapers on the ropes and the musicians eking out a living selling teeshirts instead of songs. paid for those who place value on getting what they want. 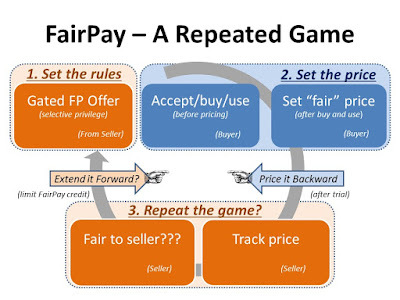 The FairPay pricing strategy that I have been developing is an attempt to rethink how we set prices to do just that. 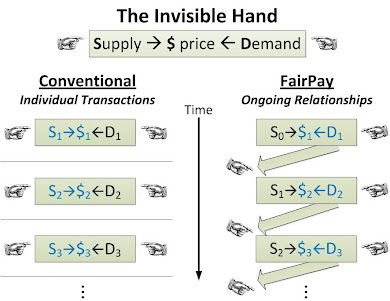 FairPay provides a new process for setting prices individually and dynamically. It does this through a "dialog about value" between users and service providers (services, platforms, creators, authors, artists, editors, producers, etc.). It applies an automated price discovery engine to manage that dialog and nudge it toward fairness. Because it is dynamic and individualized, FairPay services can transcend all pricing options to find the one that works for a each user. Those who want an ad-free service can work out pricing that buys out the ads. Those who create user generated content can obtain pricing that factors in the value they contributed (and maybe even make money at it). Those who want to try a no-ad version can try it, with no obligation to pay more than they find it worth--after they try it, and know the value. Those who do not play nicely can have their privileges withdrawn, and be offered just fixed price or ads. 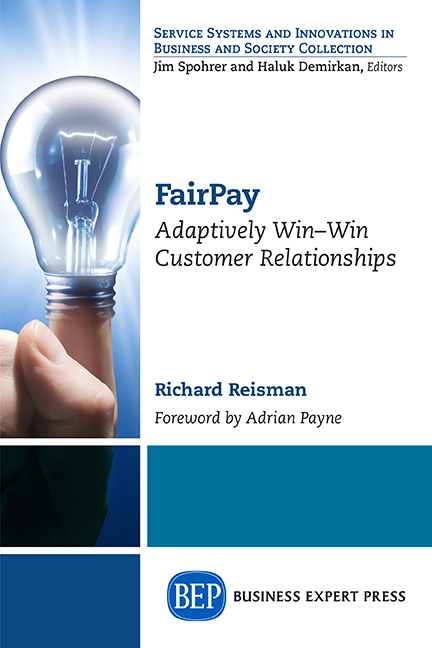 FairPay combines an architectural framework that can include all of these models, with a dialog process that allows both buyers and sellers to reach a fair equilibrium, based on the actual perceived value, considering any and all factors. Free and paid can coexist in the same service. Caldwell is concerned that prices should be based on use, and that "the definition of use is very complicated." Smart dialogs about value can simplify that to the degree desired, and yet reflect any variable that each buyer and seller agree is important. (And most of that can be automated by sellers--and eventually by consumers as well). The core idea is to view pricing not in terms of single transactions, but as a joint decision process that develops over the life of the relationship. Sellers can lose revenue on some of the abundant product, as long as they converge on a fair price over time (in money, ads, or services), for each customer. Customers who do not play nicely lose the privilege and must pay what and how the seller demands. This relationship view can turn the invisible hand to find the optimum value exchange, now that the cloud can provide abundance and manage the dialog about value. All we need to do is let go of our old ideas about pricing, transactions, and scarcity, and develop a new and far more flexible process. We need not force all users into one model. One-size-fits-all pricing is wrong most of the time, for most of the users. Lets' find an architecture that seeks the right size for each user! Details of how this can be done are elsewhere in this blog and related Web site. It is yet to be refined in practice, but isn't this the kind of economy that is best for society? One that maximizes production, rewards producers fairly, and makes the abundance they create available to everyone on a fair basis? Isn't this just the kind of smart economics the network economy was supposed to enable?